The world’s calendar is stuffed with some pretty incredible celebrations through out 2014. From gorging yourself silly on delicious fruits of the sea, to catching the hottest and trendiest new flicks to hit the big screen, and getting up close and personal with one of the planet’s most iconic gentle giants. Here is our monthly guide to the world’s most awe-inspiring festivals and events; get your diary and pen at the ready! Utah’s Sundance Film Festival is one of the largest independent film festivals in the United States and has become the premier showcase for new work by American and international independent filmmakers. Since beginning in 1978 the festival has experienced a massive growth, transforming from a small budget event into one of the world’s most famous film festivals, attended by countless celebrities and becoming somewhat of a media extravaganza. For those of you hoping to rub shoulders with some of the A-list folk, jetting into Salt Lake City will satisfy your celebrity cravings. This annual LGBT pride parade is attended by hundreds of thousands of people from across Australia and overseas. It is one of the largest Mardi Gras festivals in the world, drawing a huge influx of tourists into Australia, whilst generating an incredible $30 million for the state. Expect parades, parties and dancing across various Sydney venues, and of course a scene completely awash with colour and vibrancy. One of the most popular days during the festival is Fair Day which will be held in Victoria Park on 9 February. A giant sun-scaped picnic, various realms of entertainment, and fairground rides will invade the park for the day. If you miss out on Sydney’s festival in February then the New Orleans Mardi Gras is another fantastic option. 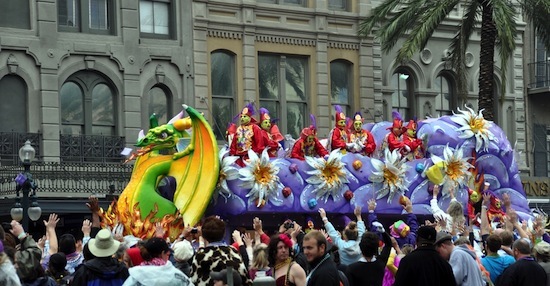 Numerous events and celebrations will be held across the city during the beginning of March, however the main event is held on ‘Fat Tuesday’ which occurs the day before the start of Lent. This is when the main parade and celebrations really kick in, with fantastic scenes through out the city, in particular the parade route that flows through the Uptown and Mid-city districts. 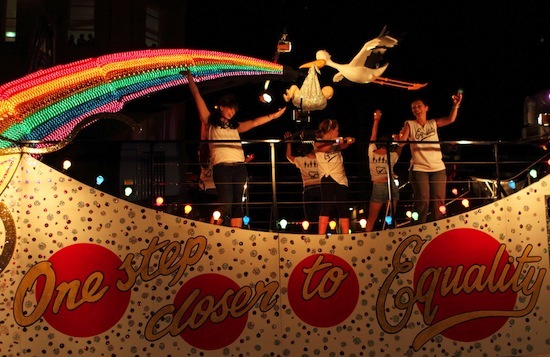 The combination of colourful floats, crazy dancing and vibrant music helps to create a truly memorable Mardi Gras experience. And throw into the mix the city’s historic and passionate jazz scene and you may just have one of the most artistic celebrations on earth! Semana Santa, which translates as Holy Week, is the most important religious week in Spain, celebrated in the week before Easter. 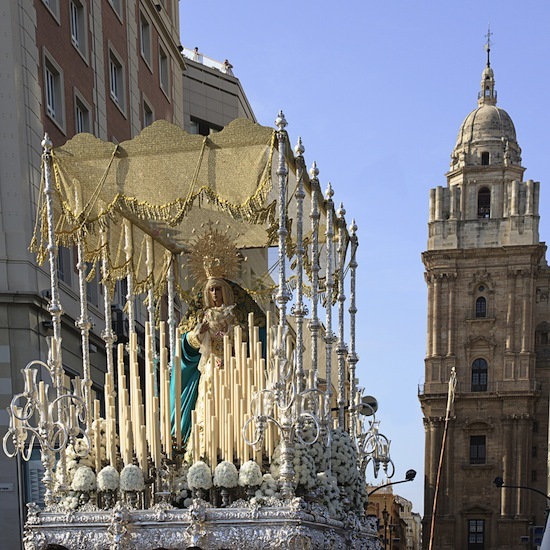 The festival will include various ‘pasos’, or floats, documenting the events of Christ’s crucifixion. During the week the city will be full of residents and visitors drawn by the spectacle and atmosphere, as well as those within the Catholic community. The night of Holy Thursday holds the most popular processions which set out to arrive at the city’s cathedral on the dawn of Good Friday. Those among us who find elephants both fascinating and wonderful in every way (the majority of mankind) will surely be attracted to the prospect of this festival. 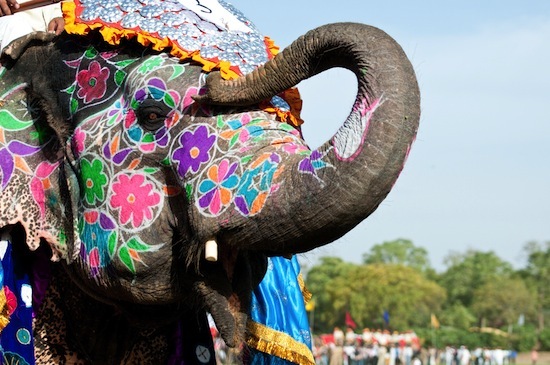 One of the best Elephant Festivals takes place in Thrissor, Kerala. A parade of 30 elephants decorated with golden headdresses, bells, ornaments and feathers slowly make their way to Vadakkunnathan Temple. Meanwhile dazzling colours and constant rhythmic drumming add spice and flavour to the atmosphere, alongside the folk dancing and early morning fireworks display. The home of football, and arguably the most successful footballing nation in the world is rightfully hosting the greatest football tournament event on the planet. The FIFA World Cup will bring nations from across the globe onto the vibrant Brazilian streets, promising a month of fantastic and versatile cultural experiences for all visitors. Besides the football and the fun, there is also a chance to indulge in Brazil’s biggest attractions. Some of the football venues will take fans to places such as Rio de Janeiro, Sao Paulo and the Amazon city of Manaus. This World Cup is surely the greatest footballing travel itinerary out there!? 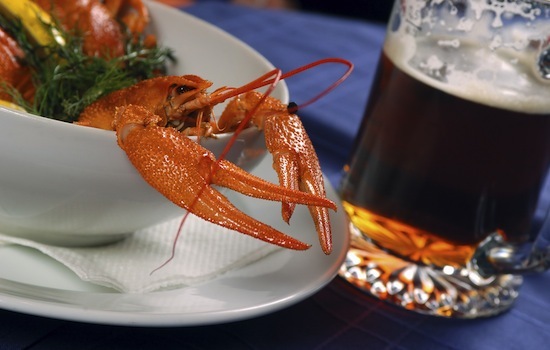 Billed as ‘Five Days of Feasting and Fun on the Fabulous Coast of Maine’, the Maine Lobster Festival celebrates 67 years of that snappy chap under the sea, most tasty and most famous in this part of the world. The festival boasts the world’s greatest lobster cooker, over 20,000 pounds of lobster, a sea goddess coronation, a lobster-fuelled parade, fantastic entertainment, arts and crafts, cooking contests, and Navy ship tours…to name but a few! Probably not a good event to visit if you’re not into your seafood. This week-long event held in the Black Rock Desert in Nevada takes its name from the ritual burning of a large wooden effigy which is set alight on the Saturday during the festival. The festival promotes the importance of community, art, radical self-expression and radical self-reliance, whilst a guideline of ten ‘principles’ have been set to evoke the cultural ethos of the event. One of the festival’s most memorable features, aside the giant burning man, is the incredible diverse outsider and visionary art on show. 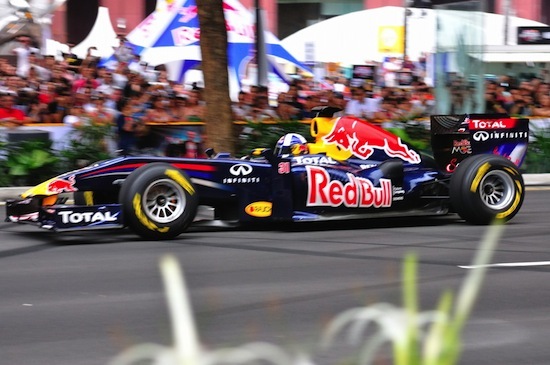 The bustling streets of Singapore get an extra kick in September as the new, iconic Grand Prix street race takes over the island for one weekend. The race is held at night and provides an incredible spectacle as racing cars speed round the Marina Bay Street Circuit, presenting arguably the most exciting race in the Formula 1 calendar. If you can’t get tickets to watch the race in one of the grandstands, then why not hit a rooftop bar and sip a cocktail or two as the petrol gushes along the streets below. Nowhere does Halloween quite like the United States, and if you’re throwing one of the greatest cities in the world into the mix, then the results are always going to be outrageous! 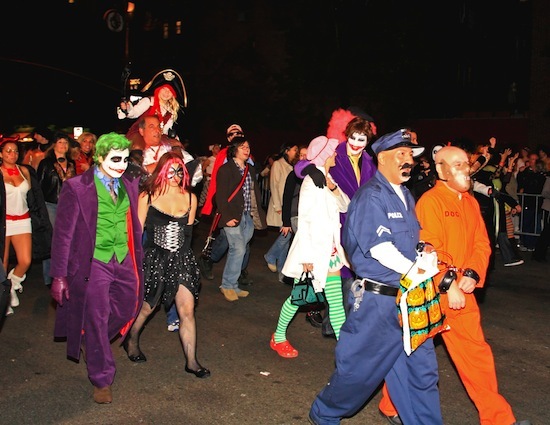 The parade takes place in the city’s Greenwich Village and begins at 7pm, just as it gets dark and all those spooky things come to life. The event draws 2 million spectators and 50,000 costumed participants, dancers, artists and performers. Among the parade’s most distinguishing features are the scary giant rod puppets that have gladly been freaking out the kids of New York since 1972. There’s nothing quite as magical as a clear night sky decorated by thousands upon thousands of floating lanterns. 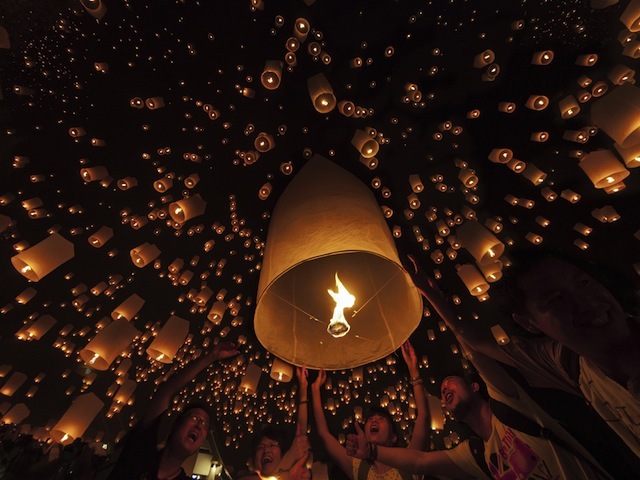 That’s what visitors can look forward to during Loy Krathong in Thailand. The most famous and tourist-drawing destination for the festival is the Northern city of Chiang Mai. Here numerous beautiful temples host individual services where monks will release lanterns in the temple grounds. The biggest party can be found by following the parade which heads along the river side. In the river you will see thousands of floating candles and baskets placed on the water by locals and tourists, which are said to contain the individual’s troubles being cast away. We may be thinking ahead, but why not plan on welcoming 2015 in style? 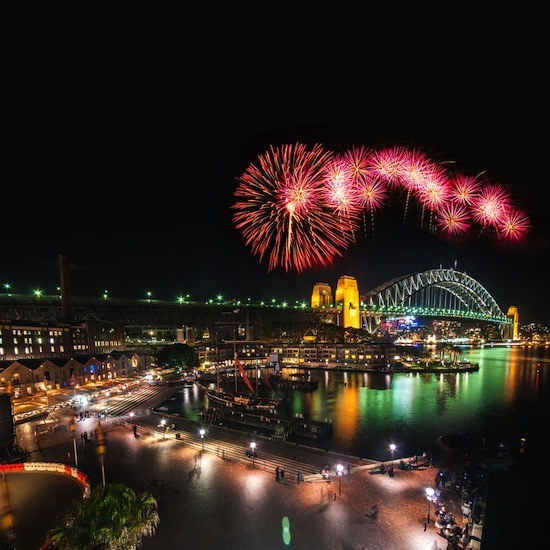 The Sydney Harbour area hosts a variety of exciting and engaging events throughout the afternoon and evening, including a beautiful lights parade on the harbour water. The main event is of course the fireworks which begin at…um…midnight. The iconic Harbour Bridge bears the biggest brunt of the display, whilst the Opera House will also be firing explosions into the sky during the 12-minute display. A mesmerising experience for anybody waving goodbye to the previous year. Which of these festivals would you like to visit?